or polarity. Like a flashlight battery, one end is referred to as plus (+) and the other end as minus (—). The " — " end is always oriented toward the centrosome, and the " + " end is always oriented away from the centrosome; microtubules lengthen and shorten by the addition and removal of sub-units primarily at the "+ " end. At one time, chromosomes were viewed as passive carriers of genetic information that were pushed about by the active spindle microtubules. Research findings now indicate that chromosomes actively control and generate the forces responsible for their movement in the course of mitosis and meiosis. Chromosome movement is accomplished through complex interactions between the kineto-chore of the chromosome and the microtubules of the spindle apparatus. The forces responsible for the poleward movement of chromosomes during anaphase are generated at the kineto-chore itself but are not completely understood. Located within each kinetochore are specialized proteins called molecular motors, which may help pull a chromosome toward the spindle pole ( FIGURE 2.11). 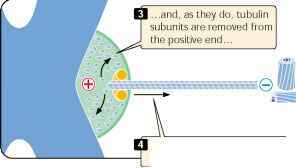 The poleward force is created by the removal of the tubulin primarily at the " + " end of the microtubule. In mitosis, deploymerization of tubulin and perhaps also molecular motors pull the chromosome toward the pole, but this force is initially counterbalanced by the attachment of the two chromatids. Throughout prophase, prometaphase, and metaphase, the sister chromatids are held together by a gluelike material called cohesion. 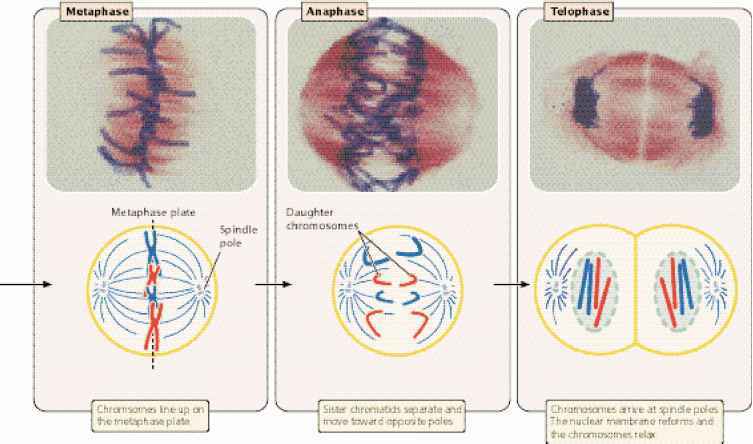 The cohesion material breaks down at the onset of anaphase, allowing the two chromatids to separate and the resulting newly formed chromosomes to move toward the spindle pole. While the chromosomal microtubules shorten, other microtubules elongate, pushing the two spindle poles farther apart. As the chromosomes near the spindle poles, they contract to form a compact mass. In spite of much study, the precise role of the poles, kinetochores, and microtubules in the formation and function of the spindle apparatus is still incompletely understood. | Spindle microtubules are composed of tubulin subunits, which are polar. Another genetically important result of the cell cycle is that each of the cells produced contains a full complement of chromosomes — there is no net reduction or increase in chromosome number. Each cell also contains approximately half the cytoplasm and organelle content of the original parental cell, but no precise mechanism analogous to mitosis ensures that organelles are evenly divided. Consequently, not all cells resulting from the cell cycle are identical in their cytoplasmic content. .. .and the - end is oriented toward the centrosome. Microtubules lengthen and shorten primarily at the + end. Molecular motor proteins on the chromosome kinetochore move along the microtubule. .and the chromosome pulls itself toward the centrosome. 2.11 Removal of the tublin subunits from microtubules at the kinetochore and perhaps molecular motors, are responsible for the poleward movement of chromosomes during anaphase. identical sister chromatids. Mitosis then ensures that one chromatid from each replicated chromosome passes into each new cell. Control of the cell cycle For many years, the biochemical events that controlled the progression of cells through the cell cycle were completely unknown, but research has now revealed many of the details of this process. Progression of the cell cycle is regulated at several checkpoints, which ensure that all cellular components are present and in good working order before the cell proceeds to the next stage. The checkpoints are necessary to prevent cells with damaged or missing chromosomes from proliferating. One important checkpoint mentioned earlier, the G1/S checkpoint, comes just before the cell enters into S phase and replicates its DNA. When this point has been passed, DNA replicates and the cell is committed to divide. A second critical checkpoint, called the G2/M checkpoint, is at the end of G2, before the cell enters mitosis. Both the G1/S and the G2/M checkpoints are regulated by a mechanism in which two proteins interact. The concentration of the first protein, cyclin, oscillates during the cell cycle ( FIGURE 2.12a). The second protein, cyclin-dependent kinase (CDK), cannot function unless it is bound to cyclin. Cyclins and CDKs are called by different names in different organisms, but here we will use the terms applied to these molecules in yeast. Let's begin by looking at the G2/M checkpoint. This checkpoint is regulated by cyclin B, which combines with CDK to form M-phase promoting factor (MPF). After MPF is formed, it must be activated by the addition of a phosphate group to one of the amino acids of CDK ( FIGURE 2.12b). Whereas the amount of cyclin B changes throughout the cell cycle, the amount of CDK remains constant. During G1, cyclin B levels are low; so the amount of MPF also is low (see Figure 2.12a). 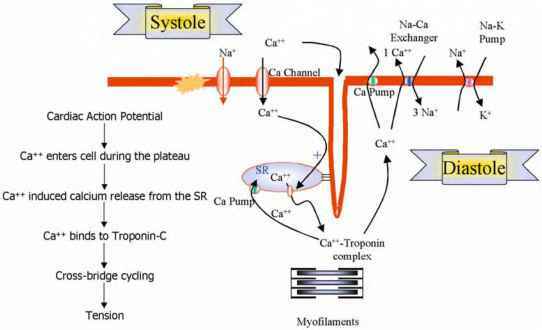 As more cyclin B is produced, it combines with CDK to form increasing amounts of MPF. Near the end of G2, the amount of active MPF reaches a critical level, which commits the cell to divide. The MPF concentration continues to increase, reaching a peak in mitosis (see Figure 2.12a).